Eric Alston is stepping down as the chair of Royd Regeneration. A man who has stood at the helm of a group working to champion Mytholmroyd is to step down after nearly a decade. Eric Alston has been the chairman of Royd Regeneration for eight and a half years, but has decided that the time has come for a change of leadership. During his time at the head of Royd Regeneration, the group has flourished, with the transformation of St Michael’s Square, the Mytholmroyd Memorial Gardens and the Christmas Market making a huge difference to the town. Speaking about his time with the group, Eric, 70, said: “It really was an exciting time to be spending a lot of money and seeing the big difference that it made to Mytholmroyd. “It’s a veryworthwhile job and I really felt I was making a contribution to my adopted town. “The real aim is to make Mytholmroyd a better place to live and work. “It’s not that I don’t enjoy it anymore. Eric moved across the county border from Lancashire to the town in 1976 with his family and has called it home ever since. And he says one of the highlights of the past eight and a half years was the group’s workto help those affected by the notorious 2012 floods. “Together with the St Michael’s Amateurs we put on the Flood Light Review and raised more than £2,000 to distribute to residents who were flood damaged,” Eric added. Eric hopes the work of Royd Regeneration will continue to have a positive impact on the town. 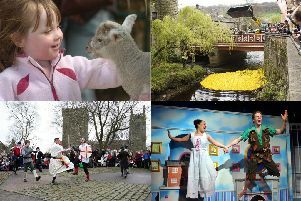 Plans for the future include making Mytholmroyd a Pennine adventure centre, championing the town’s close link to great outdoors. Eric said: “I think no matter where you stand in Mytholmroyd, you can see what a glorious position it is in. “That’s a big attraction - it’s a fabulous position. “There are so many positives and it’s a very friendly, tight-knit community. Eric will continue to serve as chairman of Royd Regeneration until the end of the year, but is also willing to stand down if a new chairman can be appointed earlier.